When we moved, we ditched our old queen bed that we’ve been using almost our entire marriage and bought a new, king-sized bed. Darn kids keep climbing into bed with us! (We also bought a very heavy bed in celebration of the plan to never, ever, ever move again ever. I like it!) Also, as you may notice in the photograph below, the master bedroom in our new house is painted green. It’s actually a very nice green, not at all like the green in the picture, but what are you going to do? Anyway, our comforter was bright red, quite ratty, and substantially too small for our new bed. With everything that’s going on, we weren’t really in the mood to go shopping for a new bedding set, so we were using the old one until I remembered something I already had that would work better. When I was getting ready to go off to college, I suddenly realized that I didn’t have my own blanket. I mean, I had blankets that I had been using, but they were family blankets. 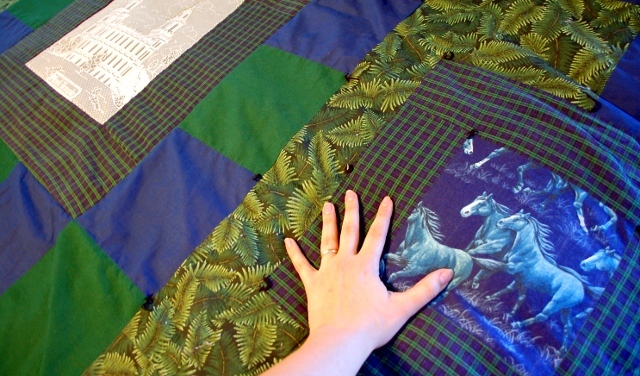 Since this was about the same time that I was working on this, it seemed only natural that I make myself a quilt. 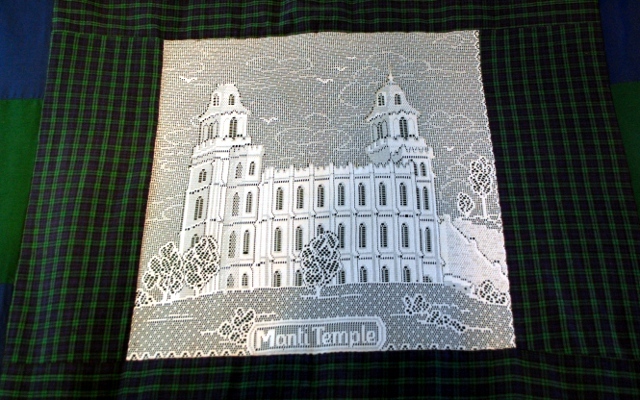 It’s a lace inset of the temple where my parents were married. My mom bought several of these decades ago and saved them until her daughters were old enough to use them. Aww. Thanks, Mom. You might possibly recognize some of this fabric, but if you do you must be a blog stalker, since I made those almost six (!) years ago. I just want to make a note here that my grandmother backed and bound this oversized monstrosity for me (thank you, Grandma!) and also gave me a quilting hoop with which I was supposed to quilt it. 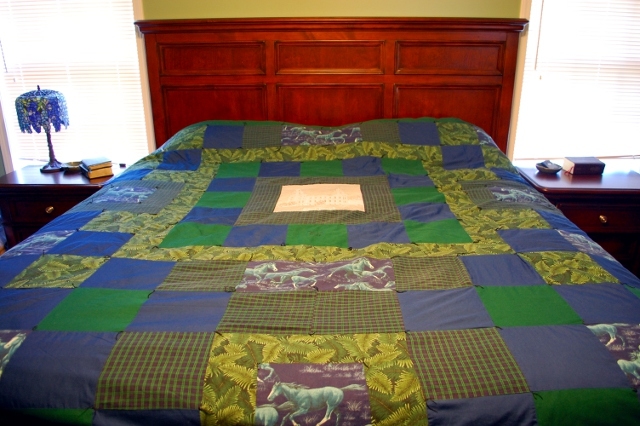 (I did quilt some of it, but for the most part it’s only tied.) My grandma also made me write my name on the hoop with a Sharpie so that no one stole it while I was at college. Yup. I always sort of thought that when I grew up and got married I might find a guy with a really cool last name, but you take what you can get, I guess. Haha!